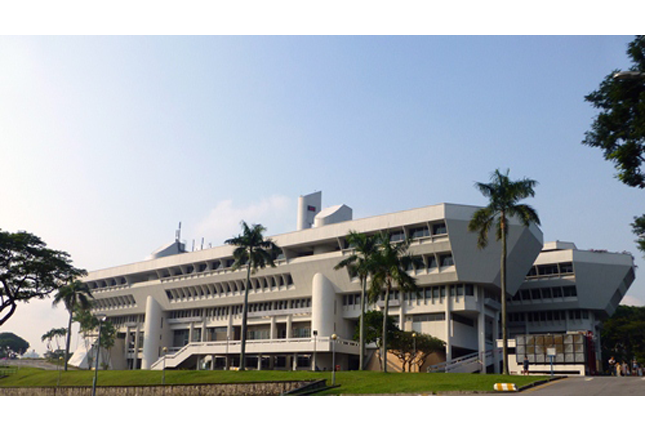 On a hill overlooking Jurong estate, Jurong Town Hall once served as the headquarters of Jurong Town Corporation (JTC, presently JTC Corporation). It is emblematic of Jurong Town’s rapid growth during Singapore’s industrialisation in the post-independence years. It also stands as a testimony to JTC’s major role in Singapore’s industrial development and the contributions of Singapore’s visionary leaders Dr Goh Keng Swee and Hon Sui Sen to Singapore’s economic progress. In 1959, Singapore became a self-governing state. The newly-formed government was presented with several challenges. Among them were rapid population growth after the Second World War; high unemployment which would be exacerbated by the population growth and the British military’s withdrawal from Singapore; and over-dependence on trade. To overcome these problems, Singapore’s economy underwent transformation which was steered by Dr Goh Keng Swee, then-Minister of Finance. Dr Goh had identified industrialisation as the key to rapid economic growth before the 1959 election. In 1960, the government engaged a United Nations Technical Assistance team to survey Singapore’s potential for industrial expansion. This team was led by World Bank economist Dr Albert Winsemius, who later served as Singapore’s economic advisor from 1961 to 1984. They produced a four-year plan which emphasised economic development and industrial growth with the government’s direct participation and provision of services in the background. With these recommendations, Singapore embarked on an ambitious push for industrialisation in 1961. It was envisioned that industrialisation, which involved expanding the manufacturing sector and attracting foreign investments to Singapore, would create employment opportunities, accelerate the expansion of other sectors in the economy and ultimately achieve rapid economic growth for Singapore. Economic Development Board (EDB) was established in 1961 to spearhead Singapore’s industrialisation drive with Hon Sui Sen serving as EDB’s first chairman. One of EDB’s key projects was to develop Jurong from a large swampy land into Singapore’s first and largest industrial estate. Jurong was identified as a suitable site for the industrial estate as it was accessible to ocean-going vessels, and had large tracts of land that could be developed for the industries. EDB invited foreign investors to participate in the industrial development plans and oversaw Jurong’s transformation: coastal and riverine swamps were reclaimed and low-lying forested hills were cleared to make way for factories. The Jurong industrial estate was to accommodate both heavy and light industries such as steel making, timber production, plywood manufacturing and slipway building. Given Jurong Town’s growth by the late 1960s, the government decided to establish a specialised agency to develop and manage all industrial estates. This would enable EDB to focus on its broader role of promoting investment and economic growth. JTC was formed by an Act of Parliament in June 1968. In the same year, Dr Goh announced several of JTC’s development plans for Jurong, including the construction of a multi-million dollar Town Hall. A national competition was launched to seek designs for Jurong Town Hall, attracting more than 30 submissions. 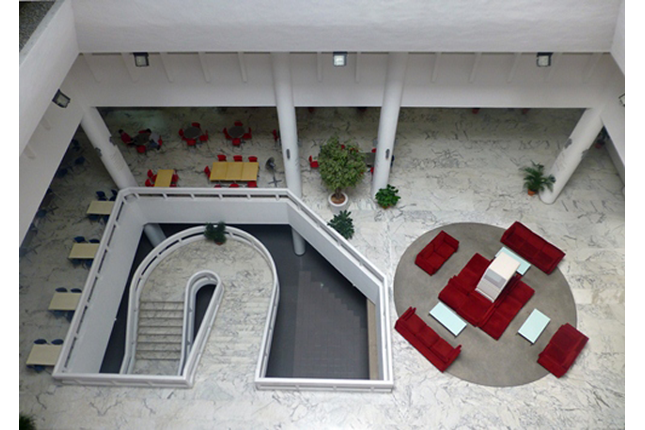 Local firm Architects Team 3 submitted the winning design, and the building was constructed between May 1971 and March 1974. 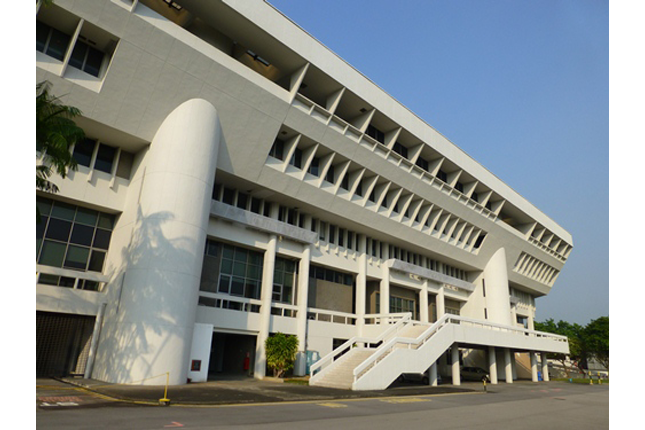 In 1974, JTC moved into Jurong Town Hall, its first permanent headquarters. The following year, then-Minister of Finance Hon Sui Sen officially declared the building open on 2 June 1975, which coincided with the week-long celebrations marking JTC’s seventh anniversary. The celebrations included an exhibition featuring goods made in Singapore’s factories and guided visits to the newly-opened headquarters of JTC. JTC brought to fruition Dr Goh’s vision of Jurong as a thriving industrial estate and a self-contained town. It also fulfilled its role of enhancing the quality of life of the residents in these industrial estates. Within seven years of its formation (1968-1975), the agency provided services and infrastructure for residents and industries, including road access from the city, railway connections, water supply, and amenities such as electricity and telephone facilities. It also provided public transportation within Jurong Town, both internally and to other parts of Singapore. 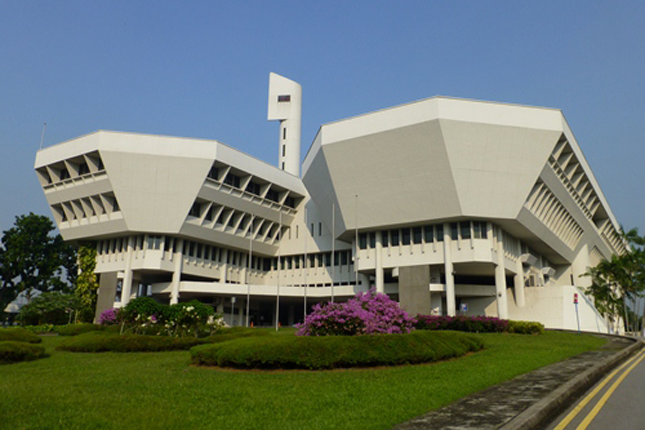 Jurong Town Hall’s design reflected the spirit of the times; it was designed to be a landmark representing the success of Singapore’s industrialisation programme. Its dignified appearance is derived from its prominent hill-top location and geometrically-defined structure. The boldly futuristic building comprises two elongated parallel blocks connected by bridges in an H-shaped plan. It is reminiscent of a ship with a 50-metre high digital clock tower serving as the ‘mast’. The top floors of the building taper inwards, giving the building its distinctive shape and providing sun shade. Its modular form and use of reinforced concrete emphasise its industrial character, making it an apt home for JTC. Architect Team 3’s design also had functionality at its core – a primary consideration in the selection of the best design for the competition. This building was intended to be used by the public and interested organisations, apart from housing JTC’s offices. 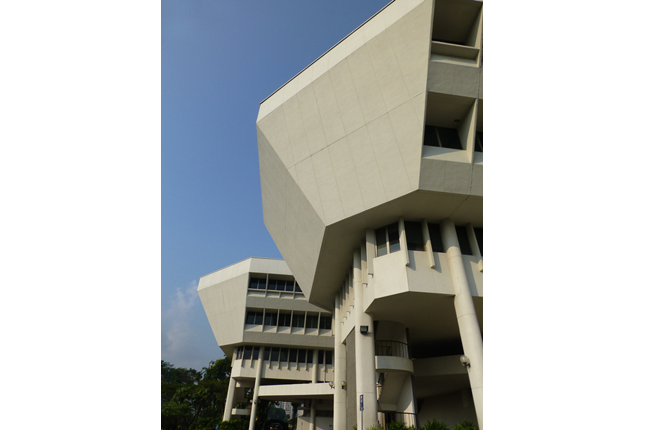 It comprises a spacious concourse, a multi-purpose auditorium, an air-conditioned lecture theatrette and fully furnished committee rooms for meetings, making it ideal for hosting exhibitions and conferences to support Singapore’s industries. As a landmark representing Singapore’s industrialisation drive, the Town Hall has played an important role in building and enhancing Singapore’s bilateral ties with other countries. In the 1970s and 1980s, the Town Hall hosted statesmen and industrial heavyweights who visited Singapore to study its industrialisation efforts and to enhance economic cooperation and trade expansion between their countries and Singapore. Other interesting events held at Jurong Town Hall include the first international tea auction held outside London, in 1981. Singapore was considered an ideal alternative international tea auction centre to London, as it lies in the midst of the world’s leading tea-producing countries and at the crossroads of Far East shipping lines. Although JTC moved to a larger building in 2000, Jurong Town Hall continues to support Singapore’s economic development. It currently houses iHub, a space for start-up companies. In March 2015, JTC Corporation announced that the new Trade Association Hub will be located at Jurong Town Hall, with the Singapore Chinese Chamber of Commerce and Industry (SCCCI) moving in as the main tenant by early 2017.